LOS ANGELES , CA – Singer/songwriter Darryl Holter announces an April release date for his latest CD, Crooked Hearts, on 213 Music. Special guests on the new CD include Dave Alvin, Benmont Tench, Gabe Witcher and Willie Murphy. In Crooked Hearts, his third album, Darryl Holter offers up dark tales of love and heartache, betrayal and crime. 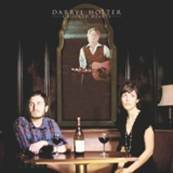 Holter is a storyteller and the characters in this album are flawed, but real. They include star-crossed lovers who run afoul of the law, lonely hearts left behind and unlikely couples brought together by circumstance and torn apart by design. The title track is a first person narrative of fleeting romance and a safe-cracking robbery gone wrong. A picturesque Parisian street provides the backdrop for “Mouffetard Noir,” a story of short-term errors of judgment and long-term regret. “Take Me Away” is a desperate attempt to escape from the rat-race by plunging into desire and uncertainty, no matter what the cost. “November Rain” finds two lovers thrown together by chance, but with no chance for a future. “Midnight in Cologne,” with Holter’s lyrics built upon the seductive melody of track four of Keith Jarrett’s brilliant 1974 album, Concert at Koln, rekindles a bittersweet memory of a beautiful episode buried in an unreachable past. The cover songs continue on similar dark themes, as Holter retrieves some largely forgotten but wonderful songs, rearranging them in ways that give them new vitality. Dave Alvin’s dirge-like “Mary Brown” clearly fits the theme of love and crime. Holter opens Richard Thompson’s “Walking the Long Miles Home” with the lonely sound of a church bell tolling at three in the morning. Benmont Tench’s “Why Don’t You Quit Leaving Me Alone” is a gently - but creatively - rearranged cry for help against a backdrop of despair. A Dylan song never recorded by Dylan, “Love Is Just a Four Letter Word,” with its final verse apparently written by Joan Baez, features vocals by Holter’s daughter, Julia Holter, a composer-singer-musician in her own right who recently scored big with two groundbreaking albums, Tragedyand Exstasis. Holter also covers “I Ain’t Blue,” written by Minnesota-based folk-blues artists John Koerner and Willie Murphy, and originally recorded on Bonnie Raitt’s first album. Holter and his talented Grammy-nominated producer, Kneebody’s Ben Wendel, once again bring some of the best names in the business into the recording studio, including Greg Leisz (K.D. Lang), Benmont Tench (Tom Petty), Tim Young (Beck), Bill Mohler (The Calling), Don Heffington (Bob Dylan) and Matt Rollings (Lyle Lovett). Special guests include Dave Alvin (The Blasters), Gabe Witcher (The Punch Brothers) and West Bank, Minneapolis legend Willie Murphy. And, to keep the listener from falling into negativity due to the dark content of most of the album, Holter tosses in a peppy little original called “Try. Try, Try,” with a catchy, toe-tapping melody that stays with you after the track is finished. With multiple tales of obsession, loneliness, and love gone wrong, Crooked Hearts takes an old musical theme, populates it with a panoply of flawed but real characters, and, ultimately, makes us feel happy that our lives are as good as they are. The LA-based singer-songwriter and Minneapolis native, whose last album, West Bank Gone, won plaudits for his portrayal of the local Minneapolis music scene in the ‘60s and ‘70s, returns to the Twin Cities April 19-21. Holter is also touring the country speaking about the early career of iconic folk singer-songwriter Woody Guthrie, to mark the centennial of Guthrie’s birth in 1912. In addition to the Guthrie talks, Holter is performing songs from his new album, Crooked Hearts. Holter, who received a fellowship from the Woody Guthrie archives in 2009, focuses on Guthrie’s political and musical evolution, from a Dustbowl populist and hillbilly singer to an urban radical and professional songwriter, in Los Angeles from 1937 to 1941. His presentation on Guthrie - part lecture and part live and recorded music – will take place at several locations in both Minneapolis/St. Paul and Madison. For more information on Darryl Holter, visit www.darrylholter.com.